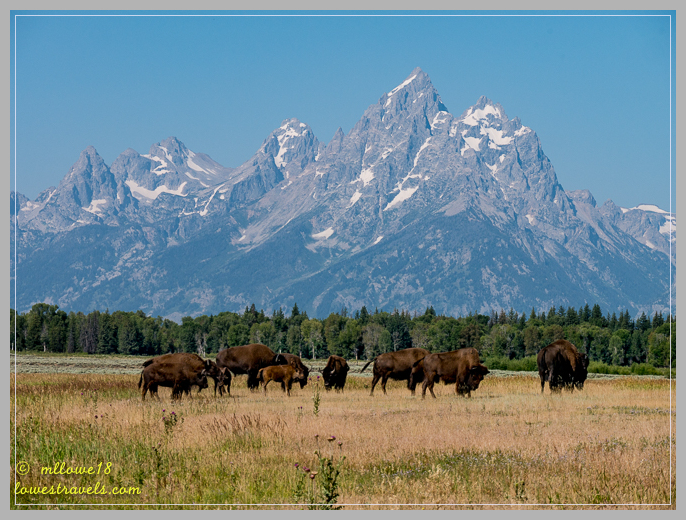 It’s been eleven years since our last visit to Grand Teton National Park, and we looked forward to driving through again while we were relatively nearby. 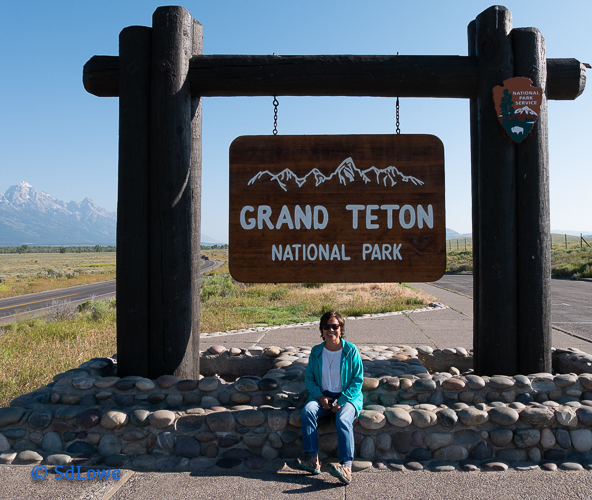 Although the crowds and traffic tend to keep us away from the national parks we’ve already visited (we skipped Yellowstone this time), our early arrival kept the crowds away until the early afternoon when we were leaving. 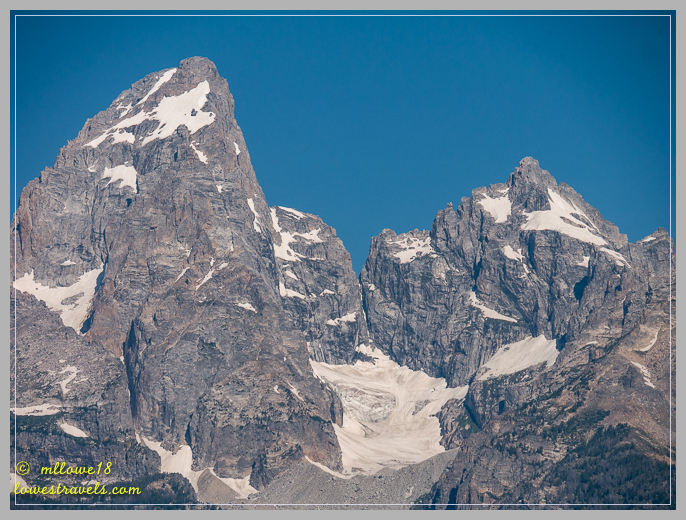 Our last visit was in the springtime when the range was covered in snow, and we really enjoyed the new perspective this summer journey gave us. 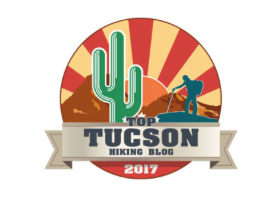 We thought of adding a hike to our tour, but the 60-mile drive from our campground at Thayne put us past our usual start time. Instead, we drove the scenic route counter-clockwise to experience the legendary beauty in a half-day visit. 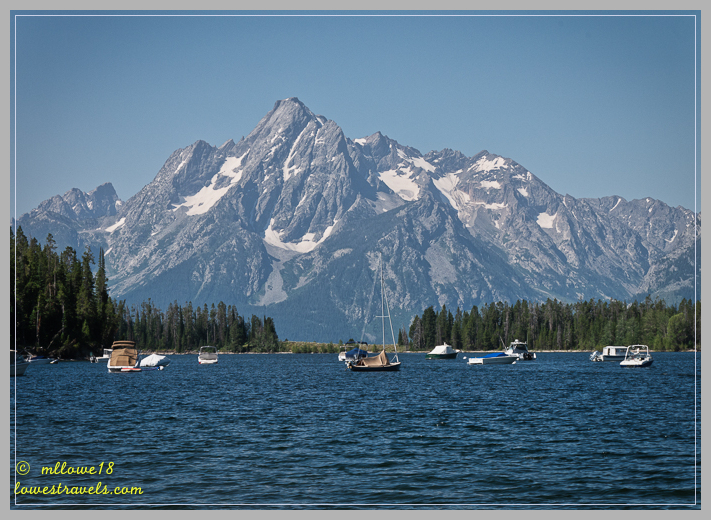 The spectacular Teton Range with snow-capped spires thrust toward the sky is a beauty to behold from every angle! At the top of Lunch Tree Hill was a plaque commemorating John D. Rockefeller Jr., who created a controversy when he purchased “the entire Jackson Hole Valley” under a different business name in 1933. His intent was to donate the land to the National Park Service to bolster the acreage of Grand Teton National Park. 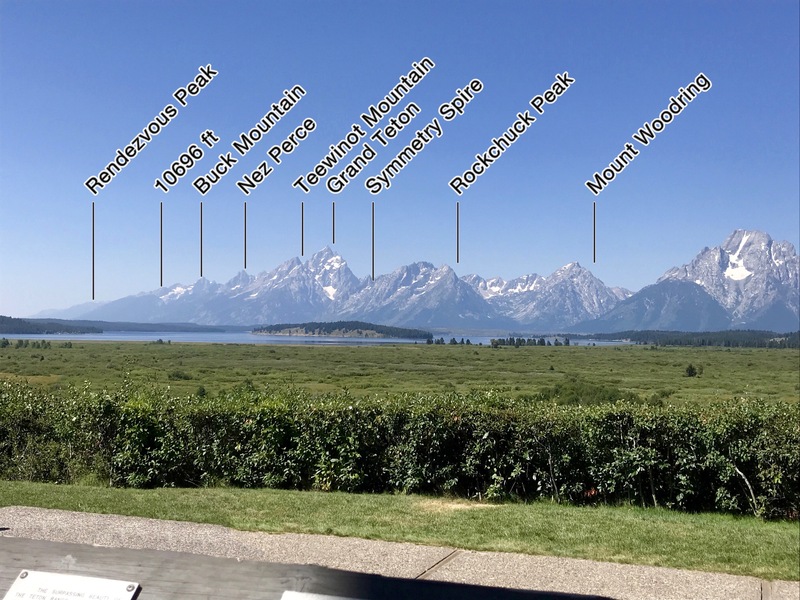 While Rockefeller’s connection to the project was revealed during a hearing, the Grand Teton National Park vision was eventually realized in 1950 with the expansion of the park to include Jackson Hole. 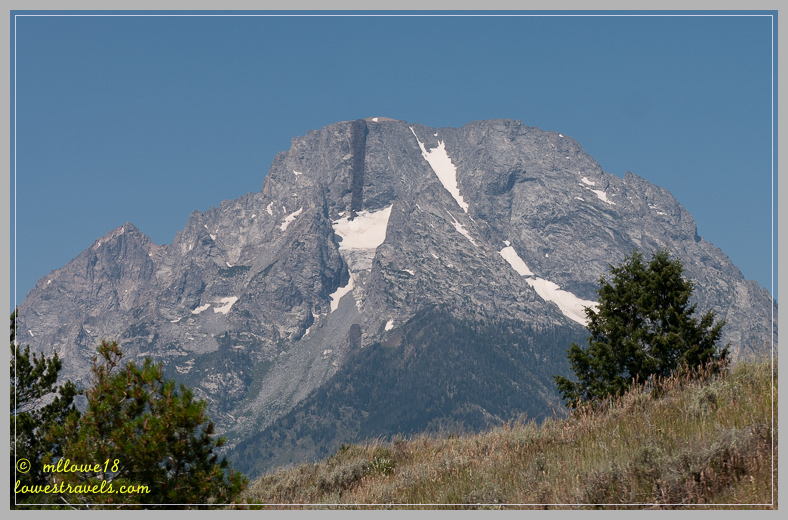 The term “Hole” was used early on by fur trappers to describe high altitude plateaus surrounded by mountains. 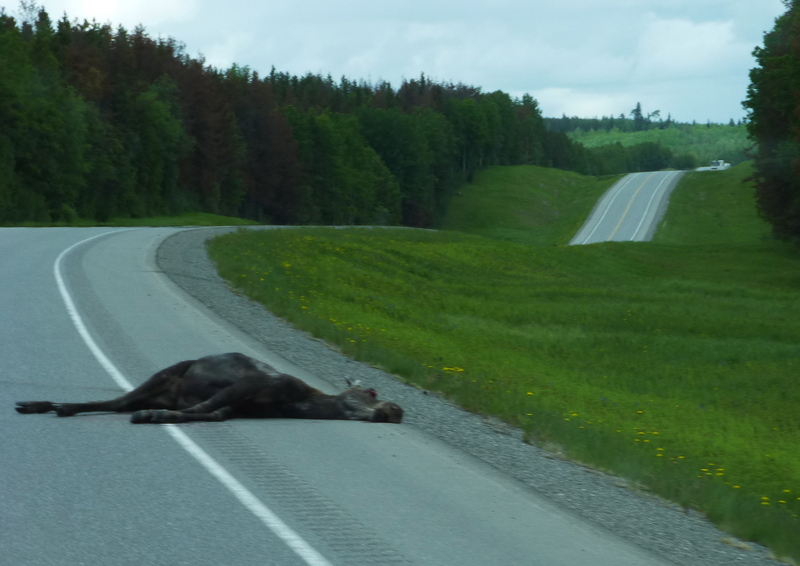 It wasn’t just bison causing traffic delays, the cowboys and ranchers have to get around too! 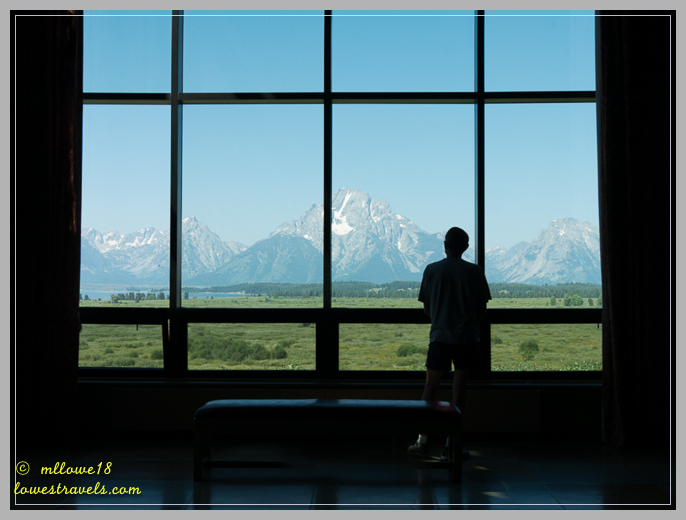 During our first visit in 2007, Grand Teton was shrouded in clouds. This time the weather was perfect to see the whole range on grandiose display. 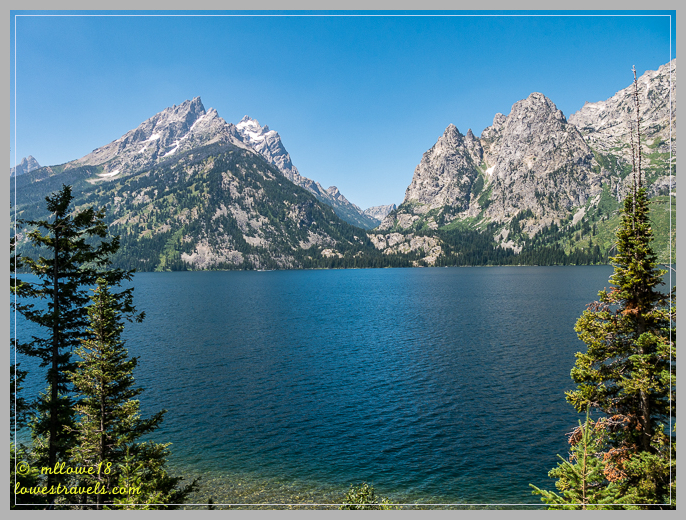 Except for the very popular Jenny Lake at the end of our drive, the summer crowds weren’t too bad. On our way home we passed through the crowded and very touristy western town of Jackson. 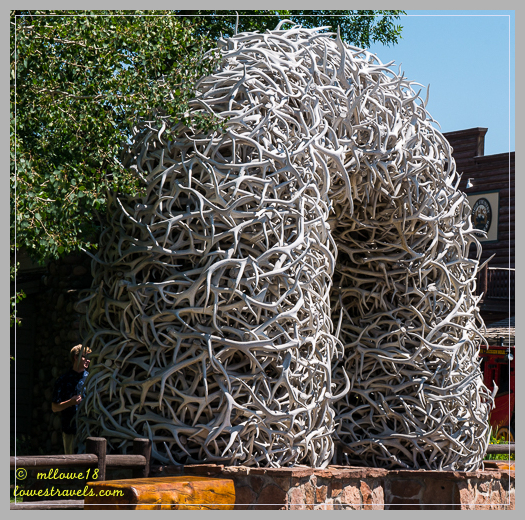 I captured one of the four dense elkhorn antler arches guarding the corners of Town Square. 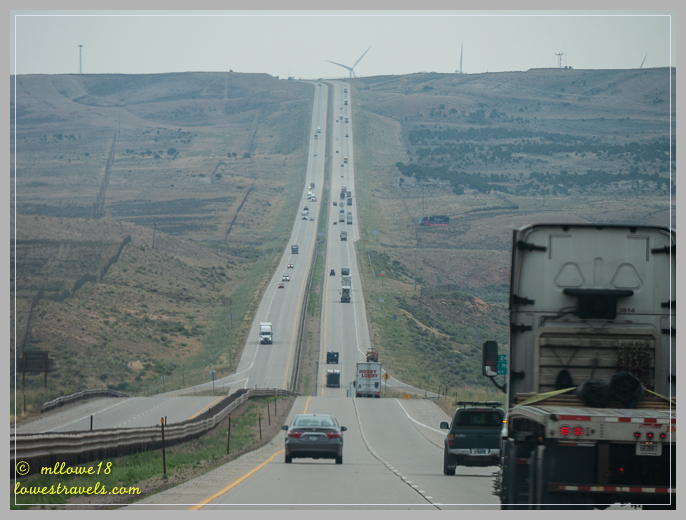 I preferred these over the larger one in Afton, Wyoming. 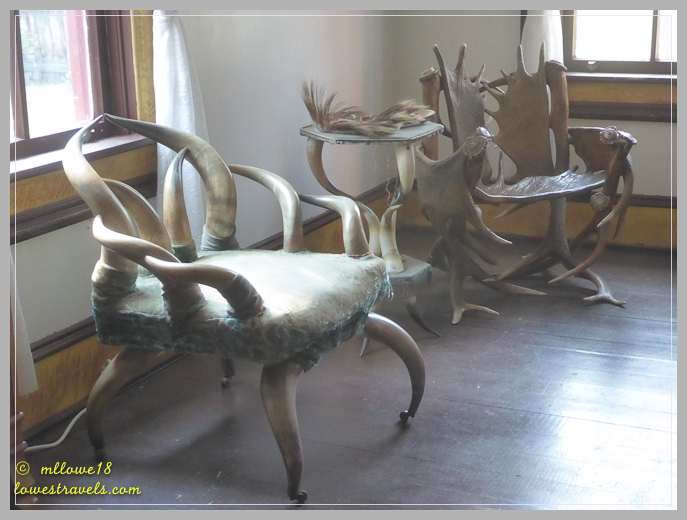 At first, I was scared to think how many elk had been killed to gather the thousands of antlers! But then I learned they simply fall off naturally from animals who grow new sets every year. Each of these arches is a mosaic of 10,000 to 12,000 pounds of antlers and replaced every 30 to 40 years. 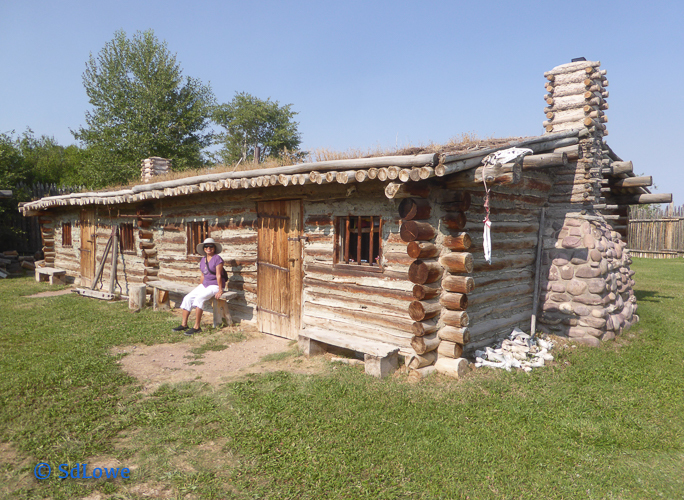 We left Thayne the following day and drove 152 miles south to Fort Bridger, our last stop in Wyoming. 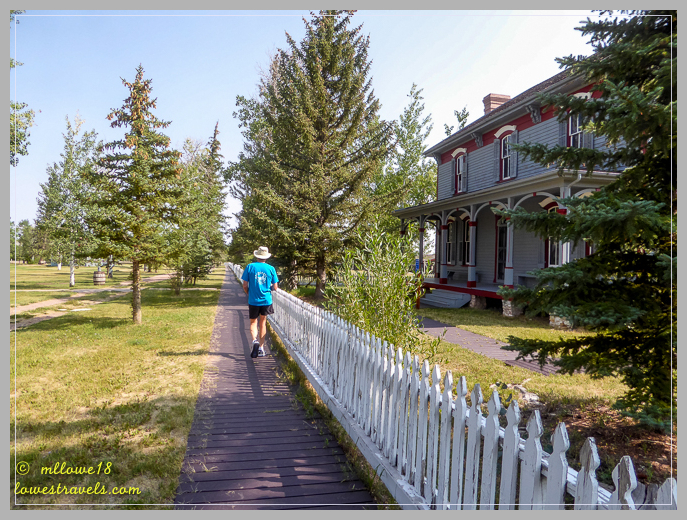 Right next door to our campground was the Fort Bridger Historic Site where we learned that Jim Bridger and his partner, Louis Vasquez, established Fort Bridger to service emigrant traffic in 1842. 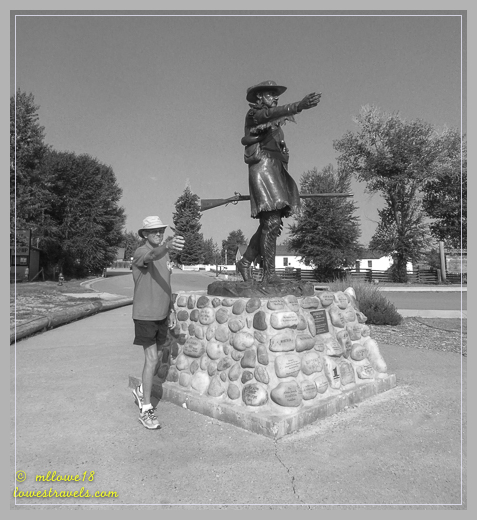 One of the plaques advised that Jim Bridger, the discoverer of Great Salt Lake, was a notable pioneer, trapper, fur trader, scout and guide. He’s been called America’s greatest frontiersman, so it’s no wonder a national forest has been named after him. 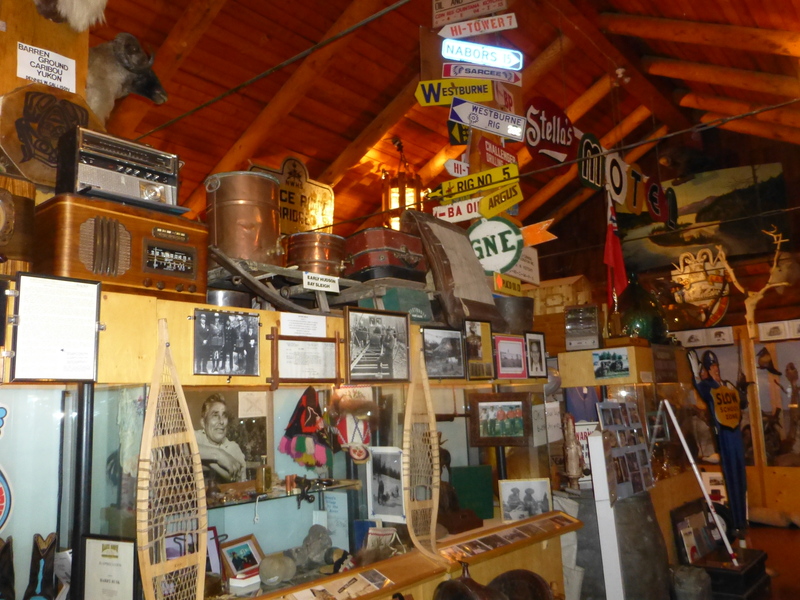 The historic site maintains and interprets historic structures and remnants from its 5 eras of occupation, including Jim Bridgers trading outpost, mormons, military, milkbarn/motel, and now a museum. 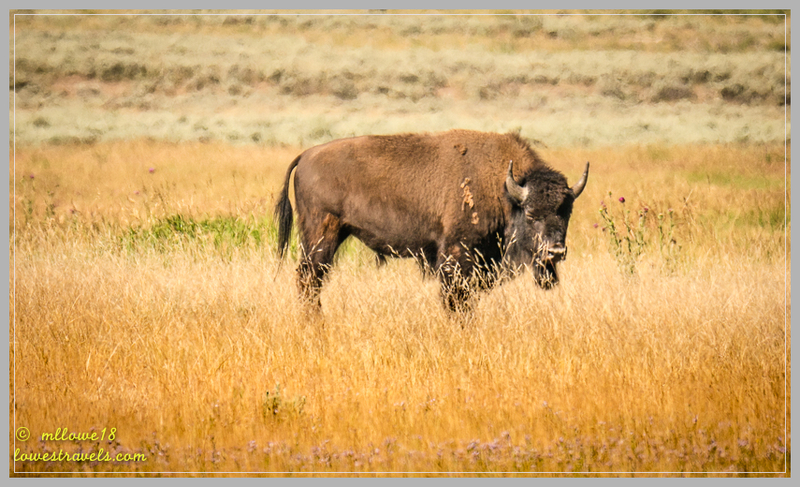 Little did we know that the area where we camped – now known as Bridger Valley – served as a crossroads for the Oregon/California Trail, the Mormon Trail, the Pony Express Route, the Transcontinental Railroad and the Lincoln Highway. 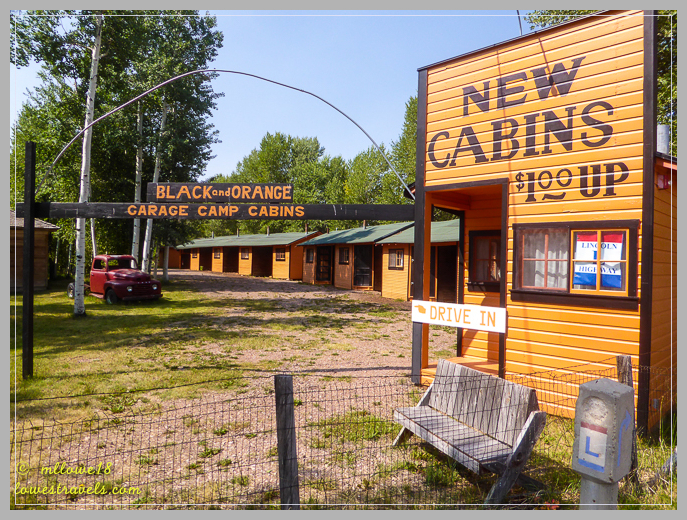 We enjoyed the quiet campground, relaxing and learning some history at the same time. 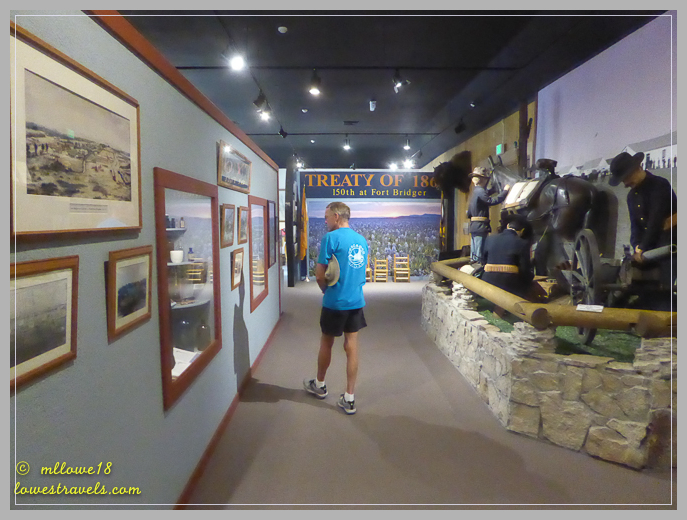 Both of our stops in Wyoming, Thayne and Fort Bridger, led us off the beaten path to see a natural phenomenon and an historic site which used to be a major stopping point on the old west trails. Note: Once again I’m slacking off on my blogging, but I have good reasons. We just got back from a wonderful trip to central Europe, and now we’re on our way to Tucson for Steve’s follow-up appointments. I have a lot of writing to catch up on, as well as reading the current status of fellow bloggers. Is this mockingbird unhappy to see us? 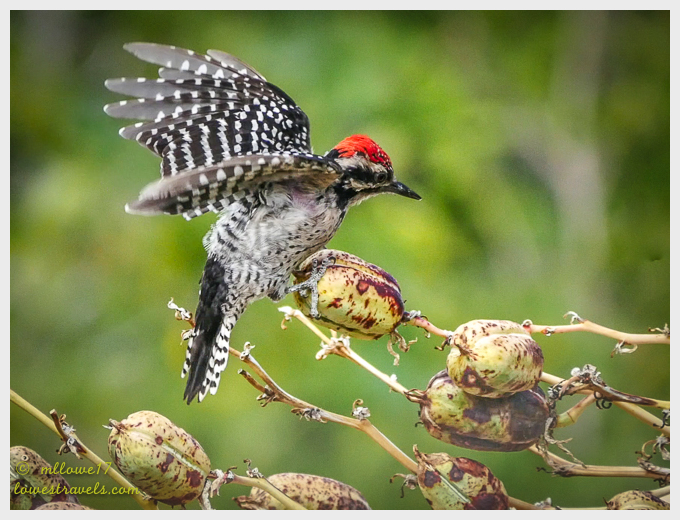 Two deep-south states – Texas and Florida – are known for their amazing assemblage of birds and other animals. The “Sister States in Birds”, as they are sometimes called, share many of the same birds – even going so far as to both claim the Northern Mockingbird as their state bird. After being amazed and fascinated by what we saw during our exploration of the Subterranean River Tour, we turned our interests above ground. Just down the island from our resort were two natural attractions; the Jungle Trekking Tour and the Mangrove Forest Paddle Tour. At first we weren’t really interested in doing the Mangrove Paddle Tour, since I grew up with mangrove trees behind my house, and we had already kayaked through mangroves in Florida. We also discovered that we would have to pay an entrance fee and hire a guide to see this one. But it was a beautiful day and we had nothing else to do – why not? Getting underway, we learned from our guide that these activities are community-based, sustainable eco-tourism projects managed by the area government. Local guides on these tours were former fishermen or farmers who are now employed to help generate income for the community. 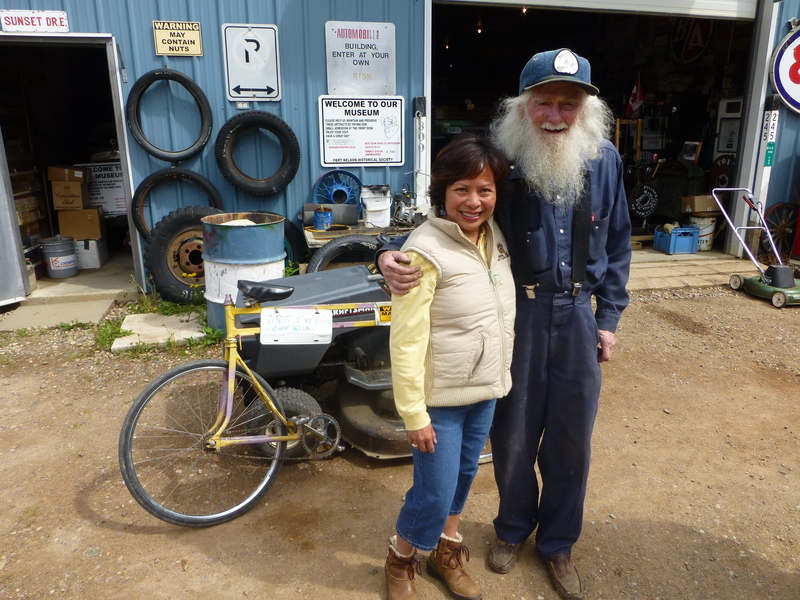 Just the thought of helping the local economy encouraged us to do both activities. I immediately became a translator for Steve, as our guide could only describe the tour in Tagalog. It was a quiet and relaxing ride as he slowly paddled us deep into the forest while following the river path. I was impressed as he explained many details of the mangrove forest and why they are protecting it – and more importantly why they are proud to have it in Sabang. The untouched old-growth mangrove trees, especially within an island forest, can rarely be seen these days, so the community is devoted to protecting them. Just another day in mangrove paradise! Since we took the first tour of the day, wild exotic birds could be heard and seen flying overhead, and we were able to spot several snakes sleeping on branches overhanging the river. I recoiled when I saw them, but our guide assured me that they sleep during daytime hours and there was no danger of me being attacked or eaten. Deeper into the forest, the mangroves stood very high above the forest floor. But what excited me most on this short paddle tour were the colorful little crabs. There were red, blue, white and orange crabs all along the shore. 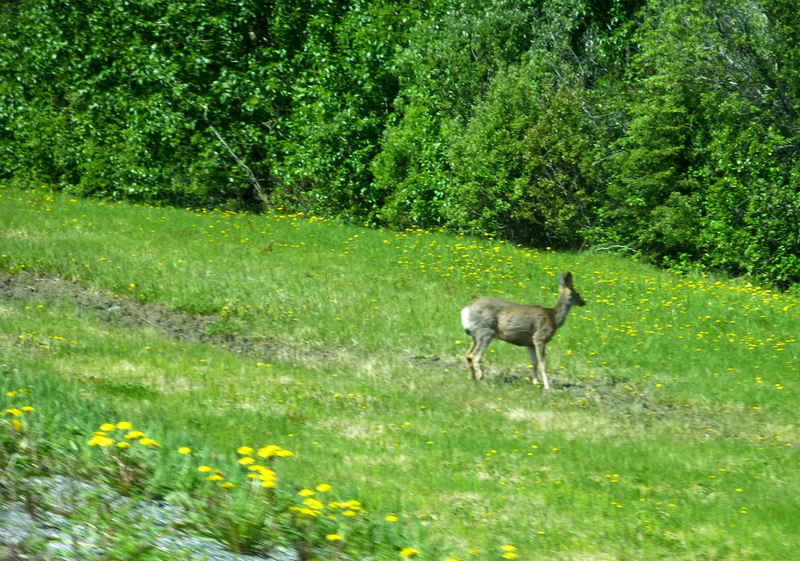 It was just too bad that in my excitement I was unable to focus on these tiny critters. Mangrove Snake taking a nap over the river. When he wakes up he simply drops into the water! …and a red one too! After the tour, our guide dropped us off at the Jungle Trail trailhead, where a new guide took over. I berated myself halfway through the hike, since I had become one of those people I usually criticize – folks who wear flip-flops while hiking. However, I somehow survived the fairly difficult 6-mile round trip over mountainous terrain. The trail passed through a lowland forest in the shadow of Mt. St. Paul, and ended where the Underground River tour began. Some of the tree roots here are more like walls! Our guide pointed out some amazing works of nature as the hike progressed. Tarzan and Jane would have been very happy here among the hundreds of vines that hung all around us. Do you see the knot in that vine? The trail was quite challenging, and we trekked through several different forest environments. We enjoyed new bird sounds we had never heard. Halfway through the hike we came into a rugged Karst Forest, formed from soil erosion. We noticed some plants that had adapted to the thin and poor soil there, and they seemed to be hanging on for dear life. Finally, we came upon a swampy ecosystem described as a major provider of several ecological functions. These plants and trees improve water quality as they absorb nutrients and toxins, providing habitat for a variety of animal species. At the end of the trail we noticed a gathering of people. As we got closer we were happy to find that several Monitor Lizards and monkeys endemic to the park were entertaining the visitors. Of course, they work for food! Is he giving me the eye? It was a jungle out there, and it took us about 4 hours to take it all in. The diversity of flora and fauna amazed us as we trudged along, and it was unlike any other trail we had followed before. During our early morning walks, the clear pristine beaches beckoned us to stop in wonderment at the works of art created in the sand overnight by the nocturnal critters. Steve thought this resembled his walking path after too many glasses of wine! These little “balls” are created by sand crabs – they form them with their saliva so the sand won’t fall back into their hole. Is that amazing or what? Beach crabs were also fun to watch as they scampered away when we walked by. There’s one of those elusive little sand crabs! And that concludes our awesome vacation in the Philippines. In closing, lets enjoy a local San Miguel beer, which is actually quite good. Cheers! Next Up: Party time at Port Aransas, Texas! 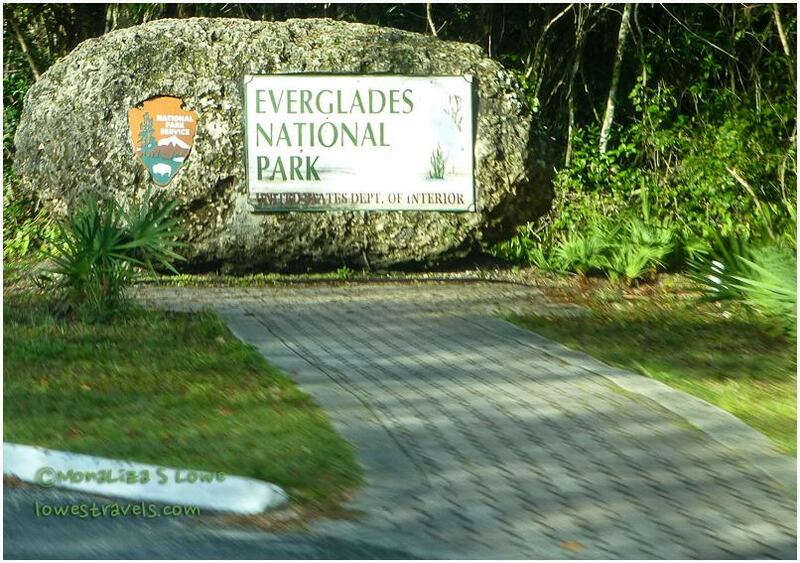 We were unsure what to expect of the Everglades before our visit here. When I thought of the Everglades, scenes of Miami Vice or CSI Miami (to be a bit more current) on an airboat, or the terrible ValueJet Flight 592 crash that occurred here in 1996, came to mind. 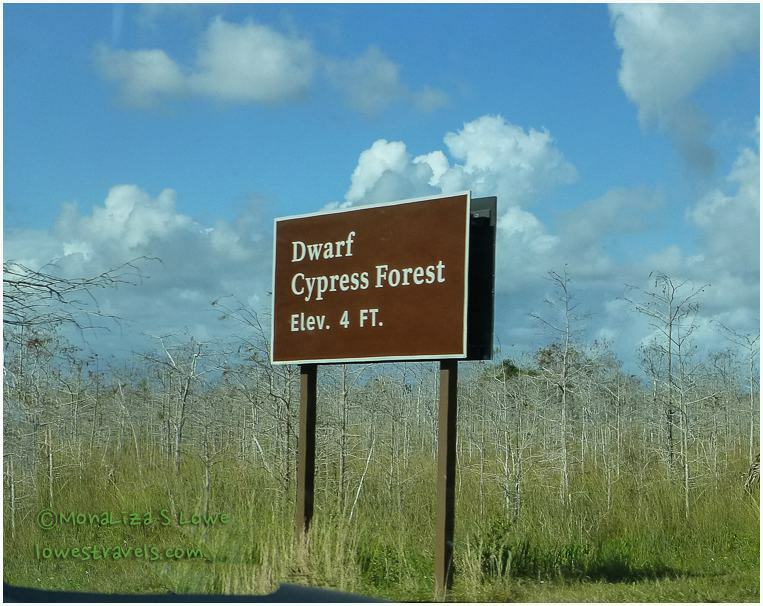 My imagination was quickly corrected as we drove through Everglades National Park. 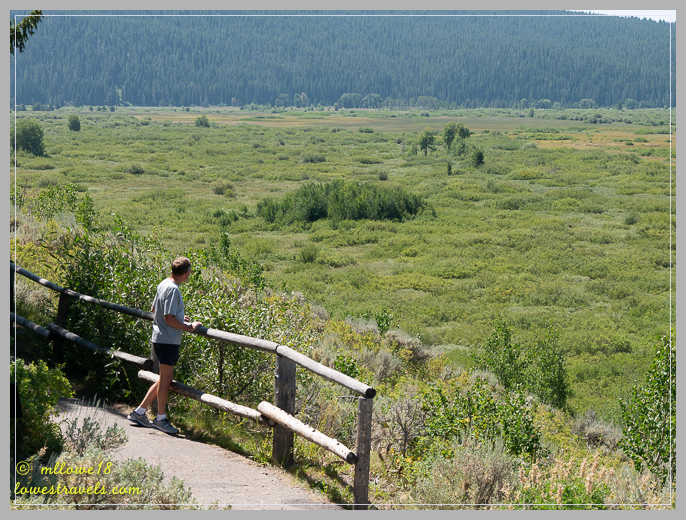 Defined by water and seemingly endless prairies, it is certainly not your “typical” park. Consisting of grassy waters, the Everglades is extremely flat, as we saw at Shark Valley. And although it doesn’t seem like this area is in a valley, it is. An elevation change of just 1 ft here makes a huge difference in the ecosystem, and the changes were very obvious as we drove and rode along the roads. 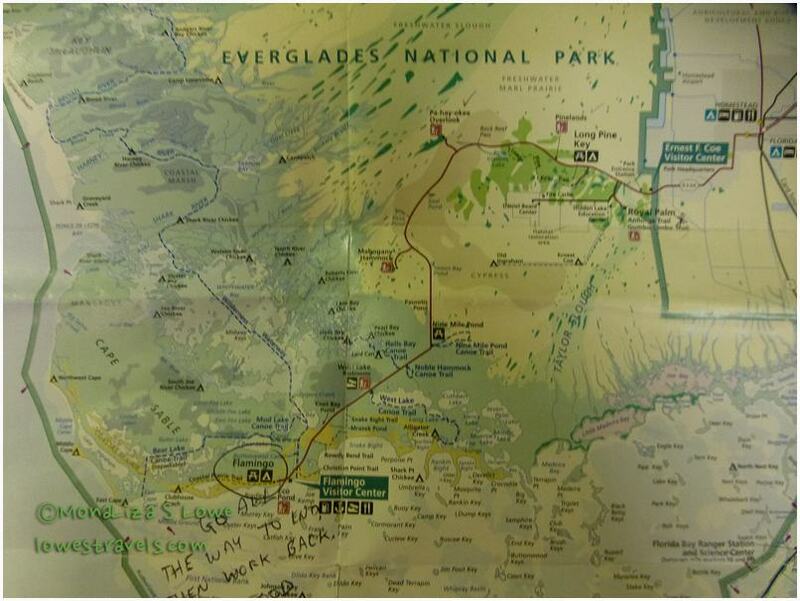 But first, why is this place called the Everglades? When early explorers first viewed the Everglades long ago, they saw large fields of grass. So they began to call it the Ever-Glades: Ever from the word forever & Glades which is an old English word that means a grassy open place. Since we had already seen a portion of Everglades National Park while biking at Shark Valley, we came to explore further its watery wilderness. Planning to spend a day in the main park, our friend Judy had suggested that the best way to do so would be to drive all the way to the end of Park Road to Flamingo, 38 miles from the entrance gate. By stopping there and getting familiar with the park along the way, we then had a plan for what we would explore on the way back out. Good suggestion Judy, and also thanks for reminding us to bring our lunch along! Although there is a small cafe that is sometimes open at the Flamingo Visitor Center, you will not find another speck of food anywhere else in this huge park. Steve and I were wearing shorts and t-shirts, not realizing that recent rains had caused the normally manageable mosquito population to increase. The park ranger warned us that all trails in the area were either “muddy or buggy”, but we followed Bear Lake Trail with the hope of seeing wading birds at the lake. No birds at the lake, and we were pretty much eaten alive by the mosquitoes for our effort. It was an uncomfortable hike through Gumbo Limbo and mangrove trees. 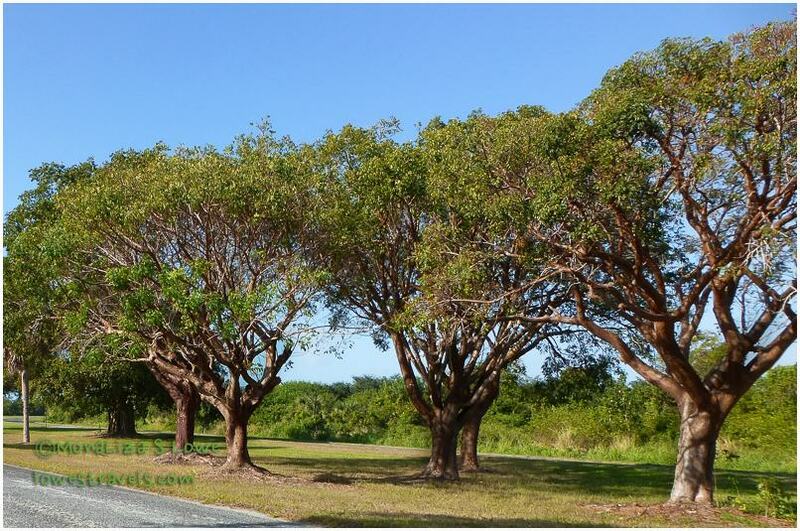 The Gumbo Limbo tree is otherwise known as the “tourist tree”, since its peeling red bark looks a lot like a severe sunburn. The hard wood was once used to carve merry -go-round horses and the trees provided rot-proof living fences. 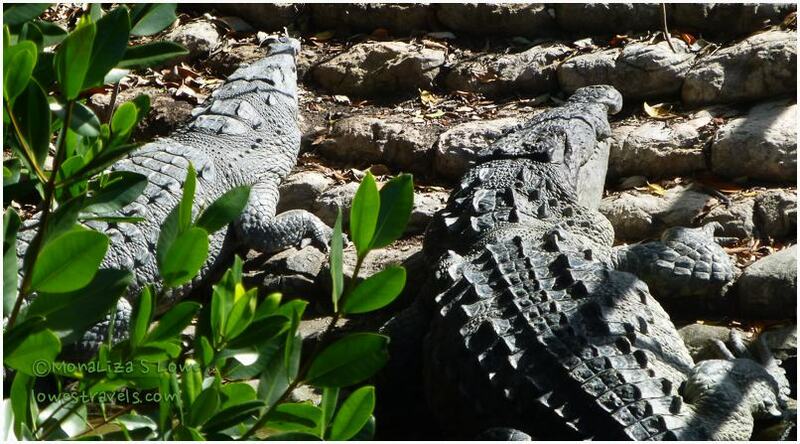 We finally saw a couple of American Crocodiles, and kept our distance from them as they basked in the sun. Unlike alligators, who rarely attack humans and are considered relatively docile if left unprovoked, crocs are more aggressive and likely wouldn’t hesitate to have me for lunch! Their color is lighter, more gray to green, and they have a narrow tapered snout and tend to live in saltier tropical coastal waters. Another difference is that both the lower and upper teeth are visible on a crocodile when its mouth is closed; only the upper teeth are visible on alligators. 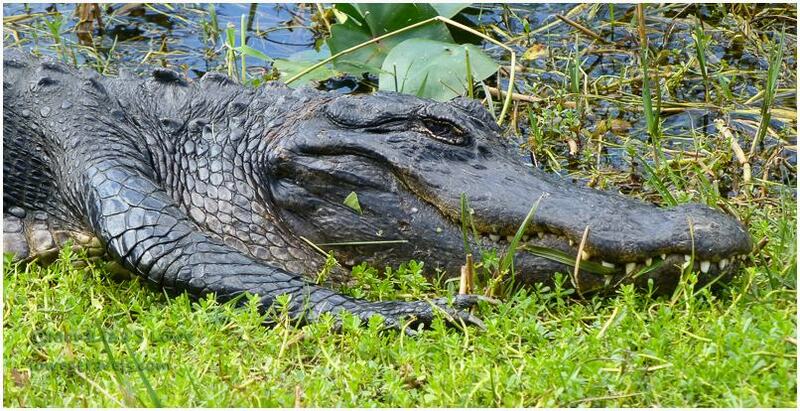 Alligators are freshwater animals, whereas crocodiles can be found in either fresh or salt water. OK, science lesson complete! 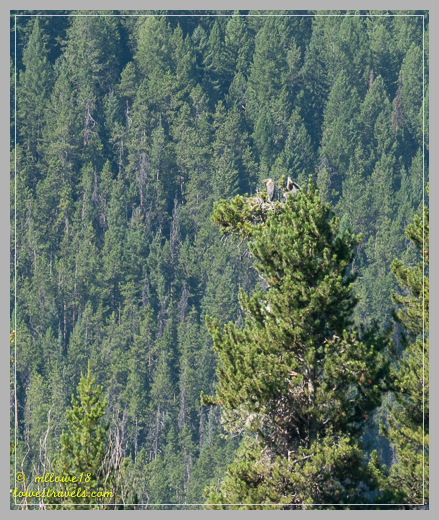 …to the subtropical Slash Pine forest which represented the remains of what once occupied 10 times more of this area. 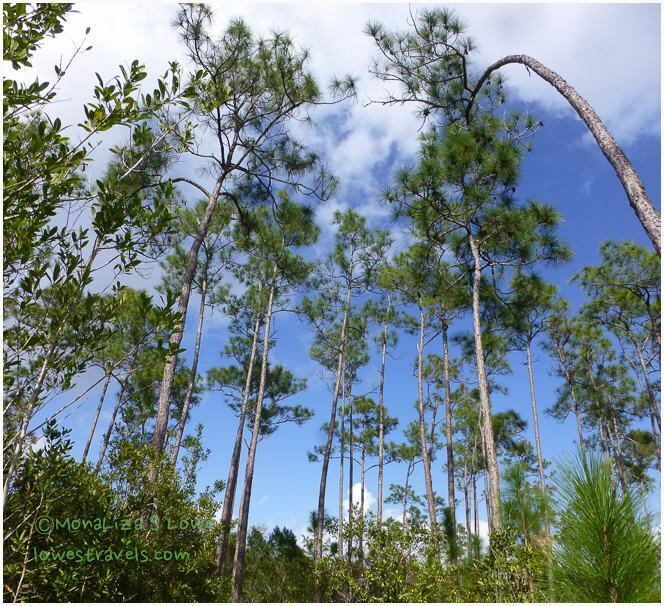 Following the Pineland Trail, we noticed several trees with odd-colored patches on their trunks. 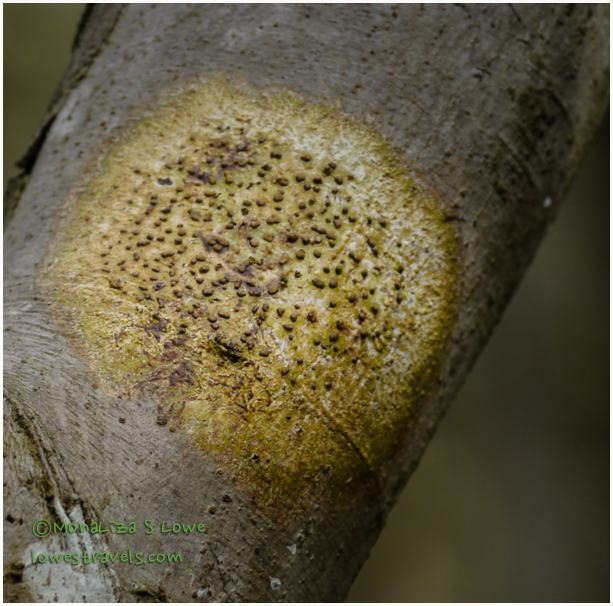 These were lichens which consist of a fungus and an algae living together. They don’t harm the tree, but rather provide a food source for Tree Snails (which were not present that day). A vast area of the Everglades could be seen from horizon to horizon from the Pa-Hay-okee Overlook. 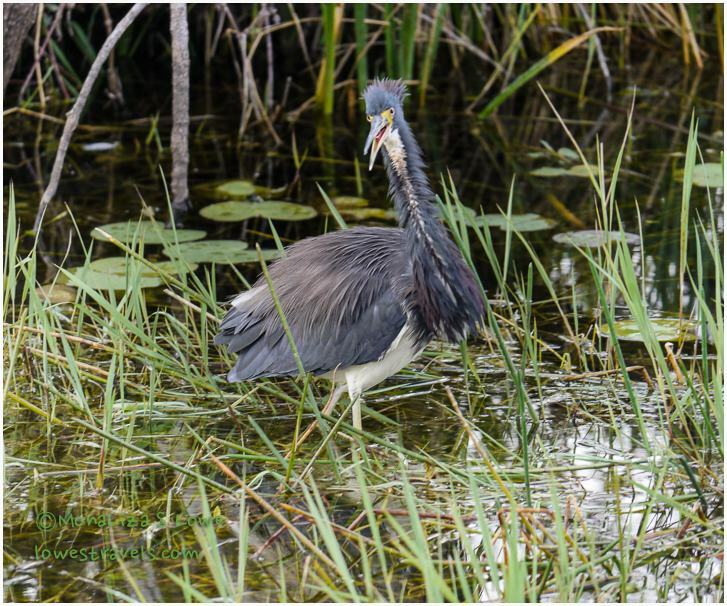 The Everglades is a wild place to explore and see amazing wildlife. Visitors can camp, hike, take a canoe, boat or kayak trip in a slough, or walk with the park ranger on a birding trek to get a front-seat view of the assemblage of wading birds. 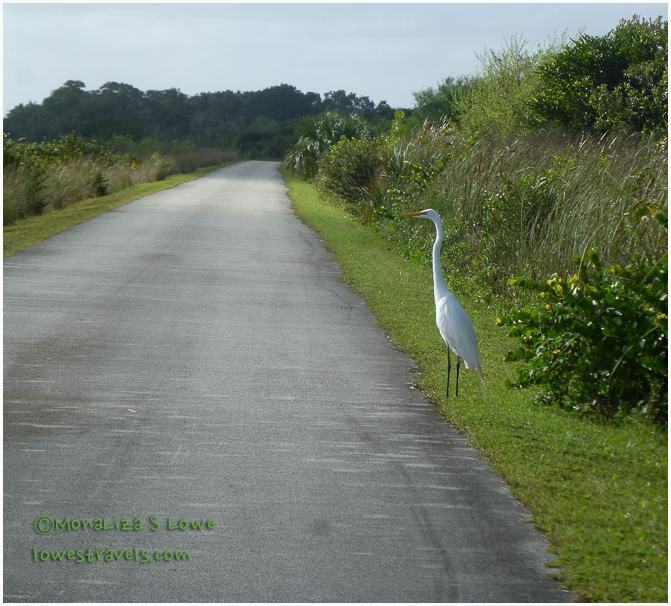 Coming here fairly unprepared, we were happy to follow the Anhinga Trail to view birds up close. Making our last stop at the Anhinga Trail (it is located near the entrance gate) gave us plenty of time to hang around and watch these birds doing their thing. The birds here are not shy! And they were in abundance! 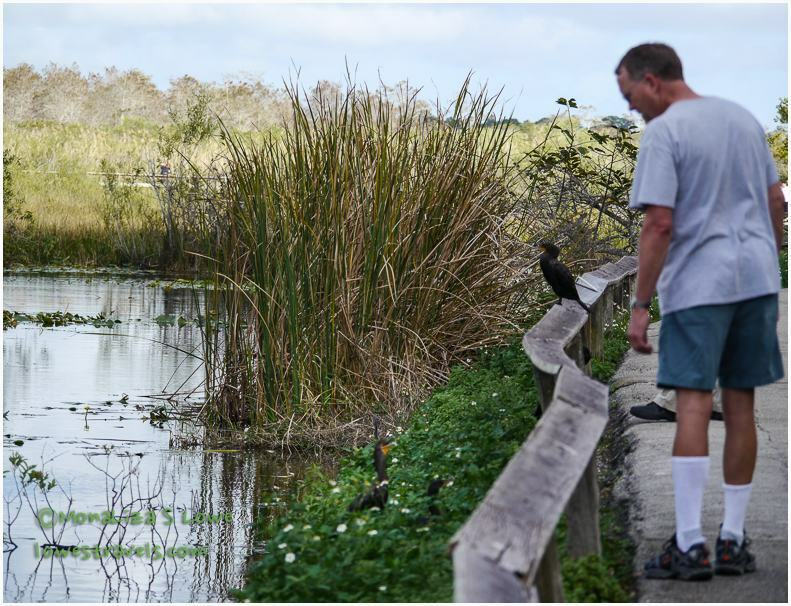 The trail’s namesake – the Anhinga – is a bird that can be seen fishing and sunning itself in the trees beside the trail. There were hundreds of them here! A visit to the Everglades would be incomplete without riding on an airboat, and this is how I had imagined checking out the area all along. 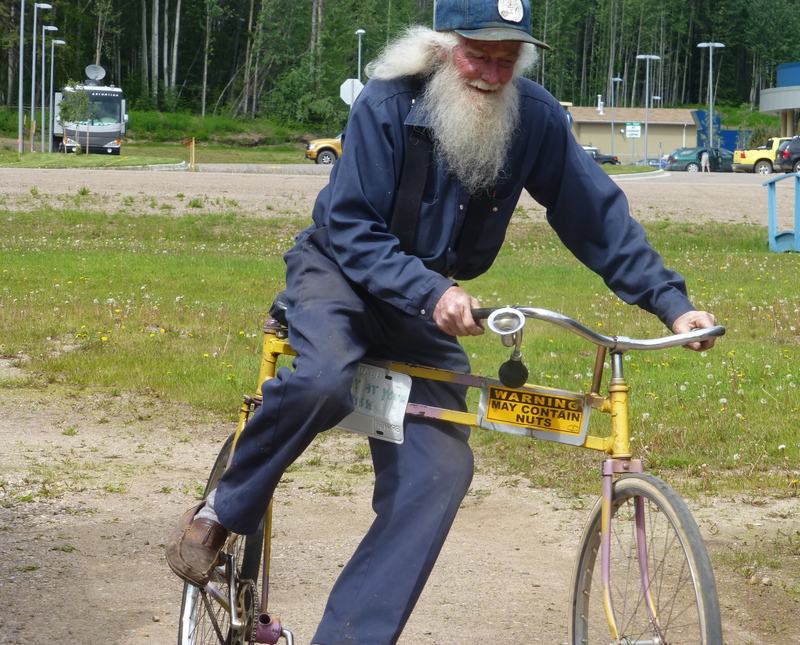 So my niece Lea E. – the ultimate hostess – made sure I got to ride on one. We glided over the river of grass, which took us to an ancient Miccosukee Indian Camp. In the 1800’s, when most of the Miccosukee tribe were removed from the west, a few never surrendered and hid in the Everglades. They kept to themselves there for about 100 years, resisting efforts to assimilated. But after the Tamiami Trail highway was built in 1928, the tribe began to accept many New World concepts. 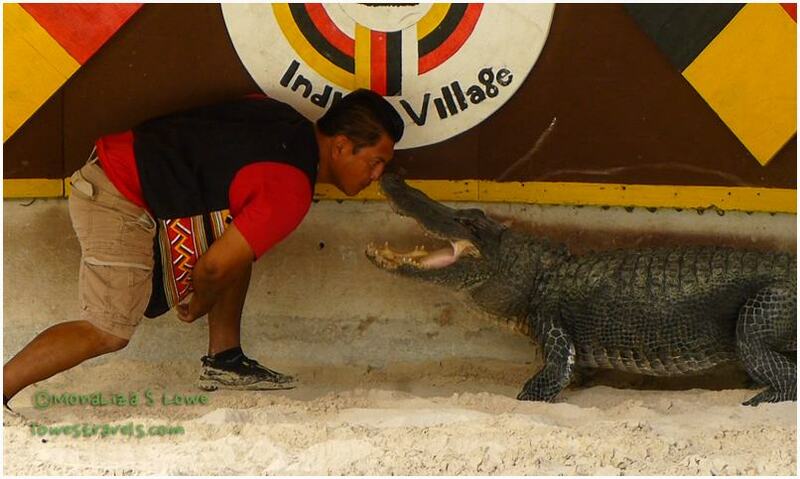 We witnessed a scary and crazy alligator demonstration at the Indian Village, watching in awe as a tribesman kissed, wrestled and taunted an alligator. No volunteers from the audience for this one! 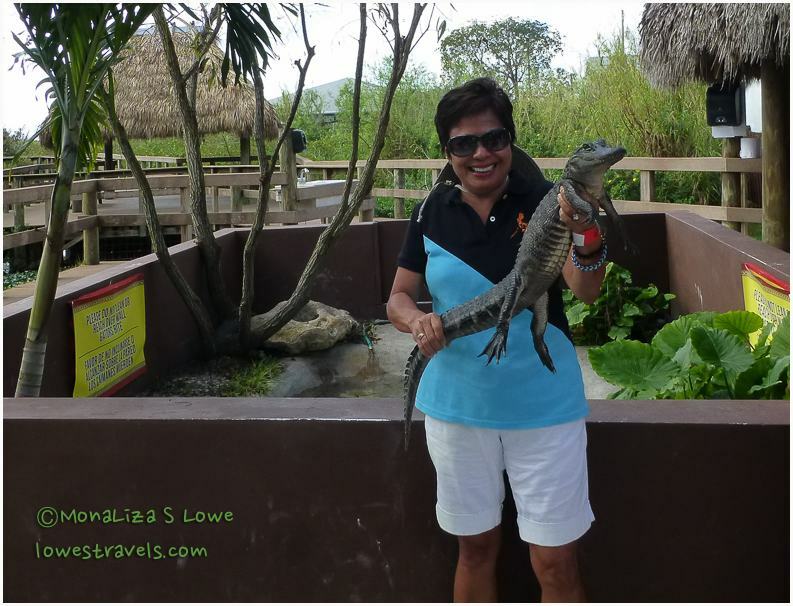 And here is a crazy tourist with a baby alligator – I can’t believe I did this! The Everglades, or the grassy waters, or the river of grass, is truly a unique place. 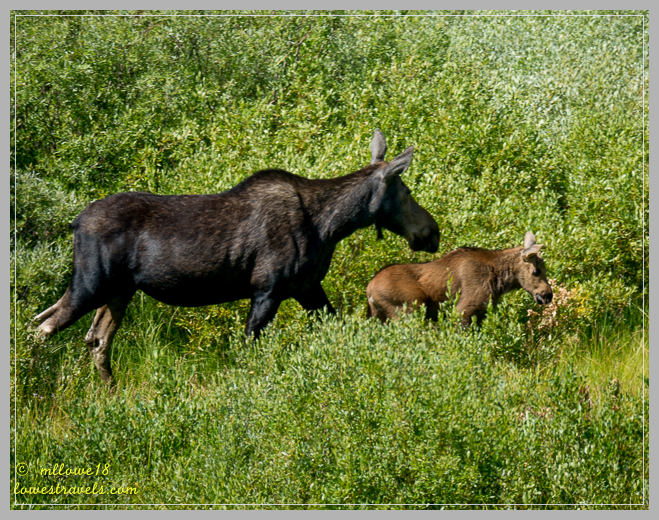 We looked very closely and saw thousands of naturally beautiful things that are there – other than the birds! Having experienced and enjoyed the Everglades, I now have a new visual that no longer includes scenes from Miami Vice or CSI Miami. Next up: Going to the Keys, baby! Our January stay at Bonita Springs went by too quickly. The next thing we knew the slides were coming in and the jacks were coming up, and off we went. 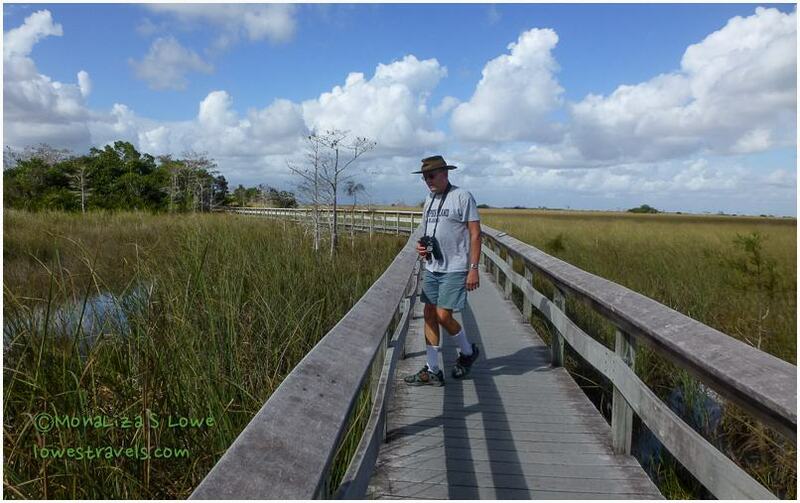 On the move again, we headed even further south to “The Glades”, the Everglades that is. Shark Valley lies in the heart of the “True Everglades”, or river of grass, that stretches 100 miles from Lake Okeechobee to the Gulf of Mexico. 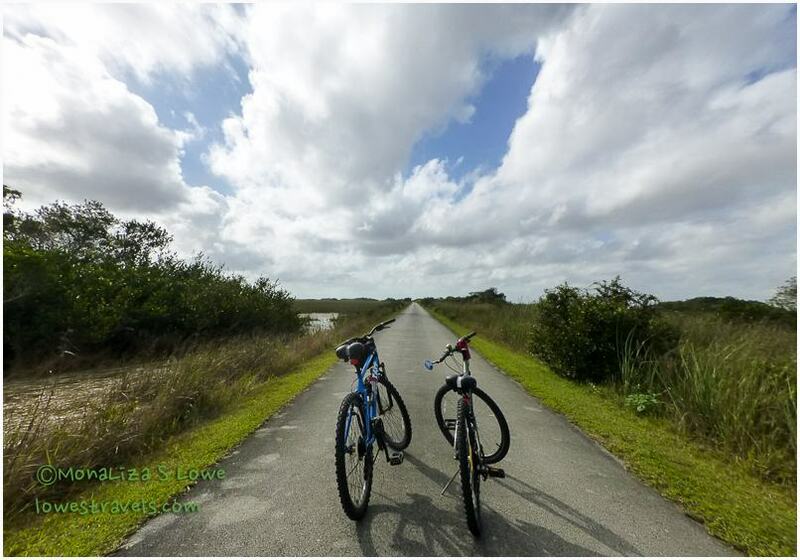 We were told that bicycling is a wonderful way to view the Everglades at our own pace. 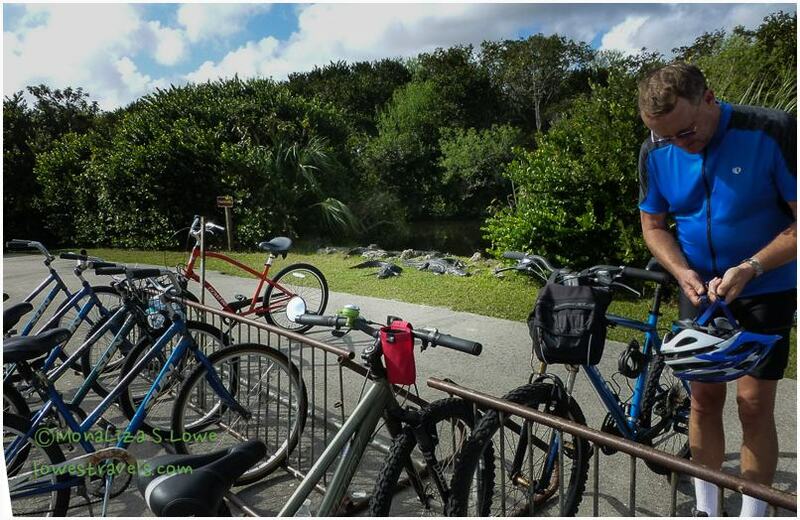 And there is no better place to bike than at Shark Valley, which is part of Everglades National Park. 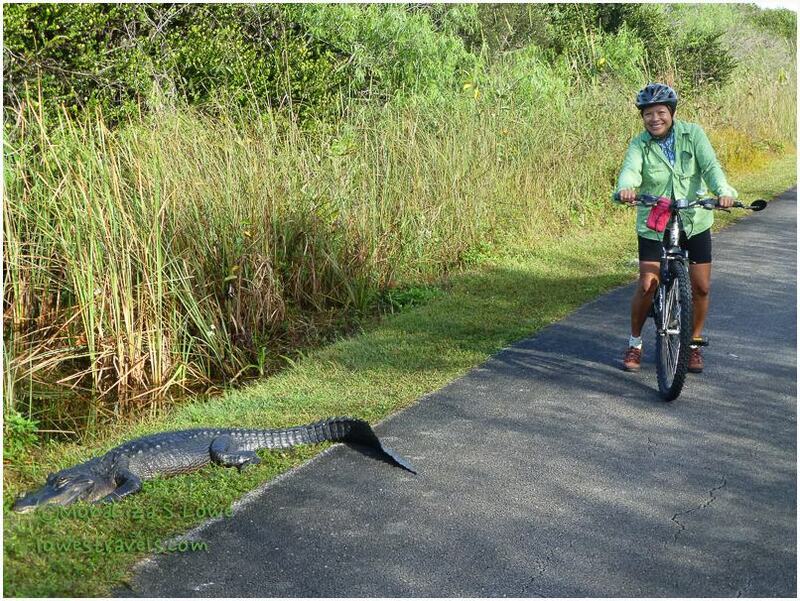 The level, paved 15-mile path makes for easy riding – just watch out for the alligators! 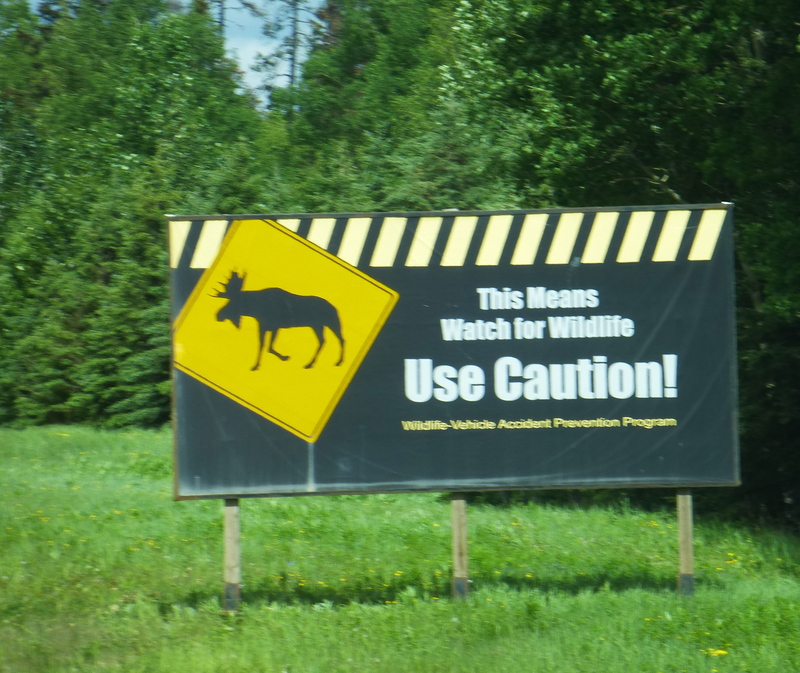 Since wildlife abounds here, I thought it would be a great way to spend my birthday. So we loaded up the bikes and headed out to Shark Valley bright and early, knowing it would be a hot day. 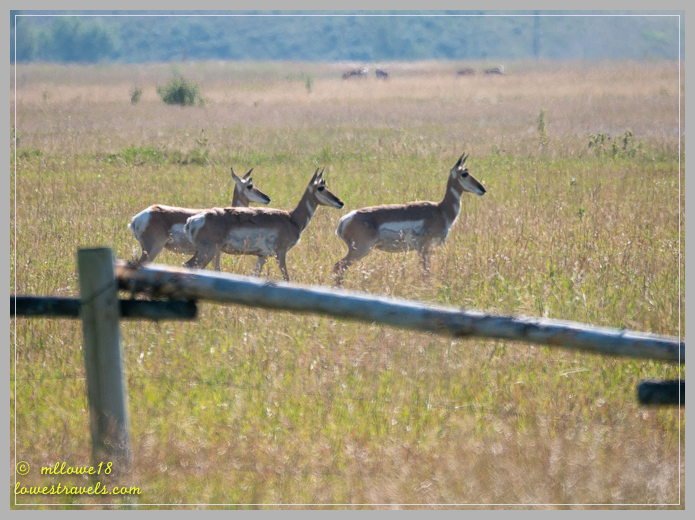 The 15-mile paved road was completely level and gave us a perfect opportunity to enjoy the wildlife. I was excited to find out which animals or birds would turn out to greet me and wish me a happy birthday! You silly girl, stay away from me! Ok, you won’t see any sharks here and I was not expecting to. Shark Valley is in a very wide, very gradual, low-lying valley. The shark reference comes from the Shark River. The mouth of this river is at the Gulf of Mexico, and the Shark River Slough is the main source of fresh water for this part of the Everglades. If you were to venture along the river far enough toward the gulf, you would indeed encounter sharks – they just never make it up to the Everglades. 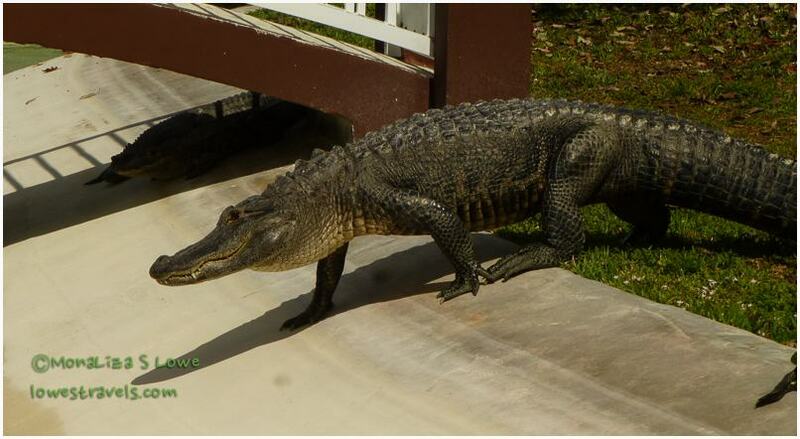 Instead, the alligators bask in the sun along the river, or at the bicycle parking, or near photographers. An observation tower at the halfway point provided panoramic views and we enjoyed the tranquil vistas of the Everglades, extending outward 20 miles in all directions. Along the route we met several trams – another way to enjoy the area. The tram tour offers a two-hour open air guided commentary, and sightings from experts which gives folks the Everglades experience. Several wood storks can be seen along the route. These birds are listed as an endangered species, as its decline is the result of vast environmental threats that exist in the area. The human disruption of the water cycles affects the crucial feeding and nesting conditions for wildlife. 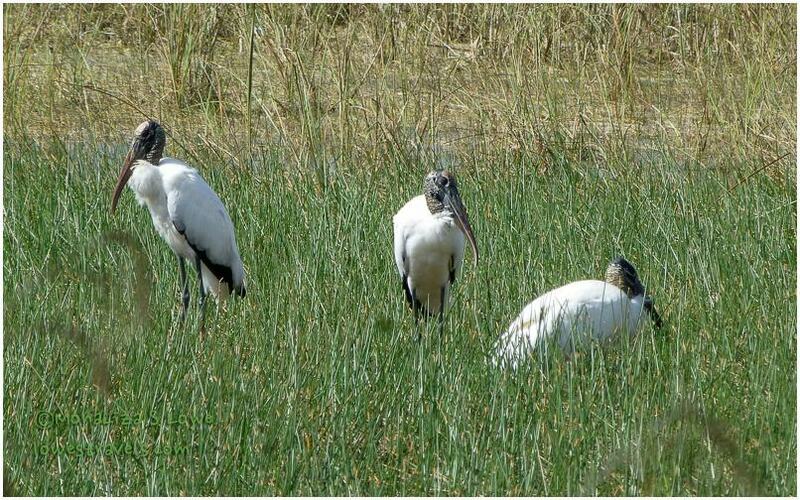 When human water management upsets the natural wetlands cycles, wood storks fail to nest successfully. There were 5000 nesting wood storks in the ’60’s, now only 500 remain. Besides the many alligators lining up along the trail to greet me, other wildlife also came out to say hello. It took us about three hours to complete the loop as we made many stops to look around, and of course I took dozens of pictures of, you guessed it….birds! And nature’s best birthday gift was the presence of the various species of Herons. I could not have asked for more! For those of you planning to come this way, be sure to stop by Shark Valley. 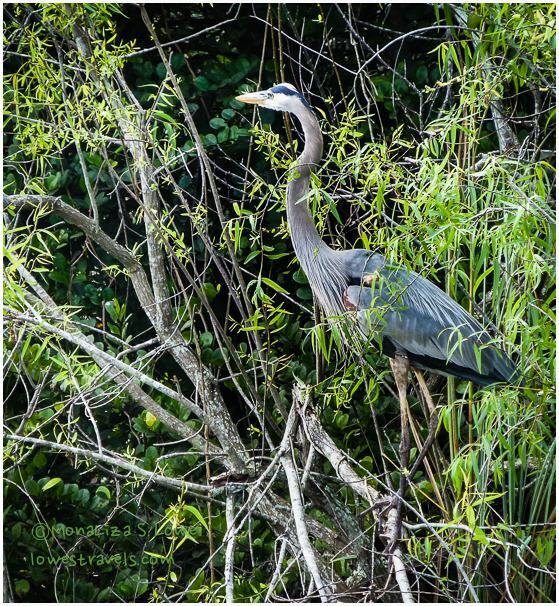 It’s a wonderful place to enjoy the Everglades and view wildlife in their natural habitat – this is not a zoo! 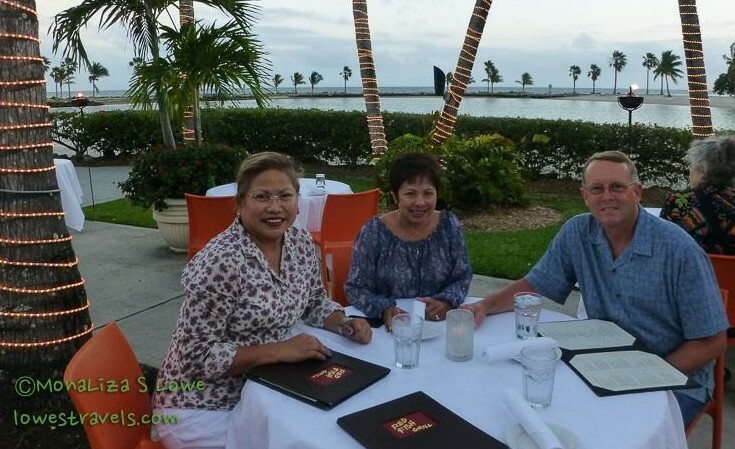 And to cap a wonderful day with nature, my niece Lea E. took us out for a fabulous dinner at Red Fish Grill Seafood Restaurant. It was located inside Matheson Hammock Park, right on the coast. With a unique setting amongst the coconut trees, it was a perfect ending to a perfect birthday. 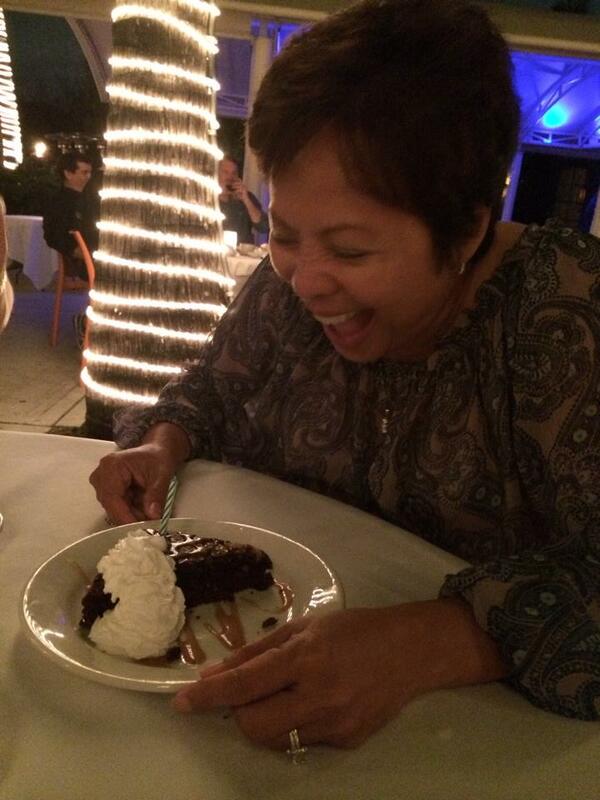 Thank you Lea E, for treating the birthday girl to a wonderful dinner! Such a happy birthday it was! 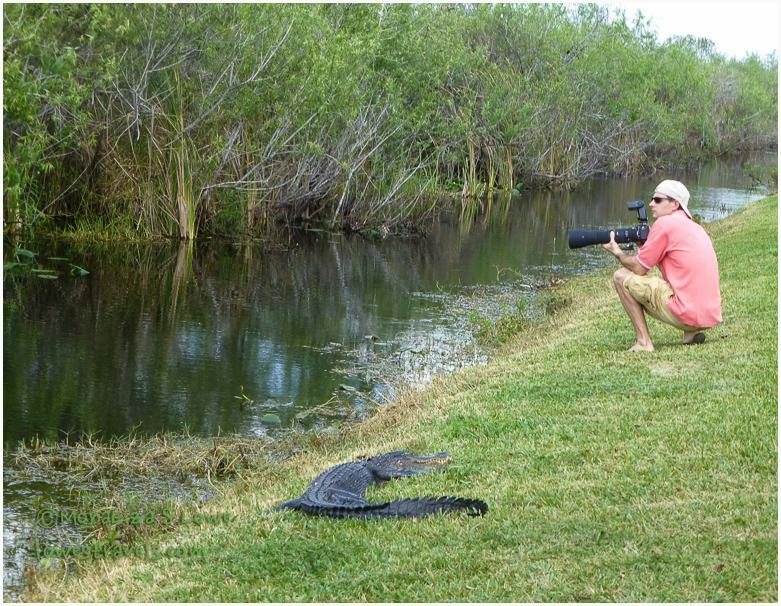 Next up: More fun in the Everglades! 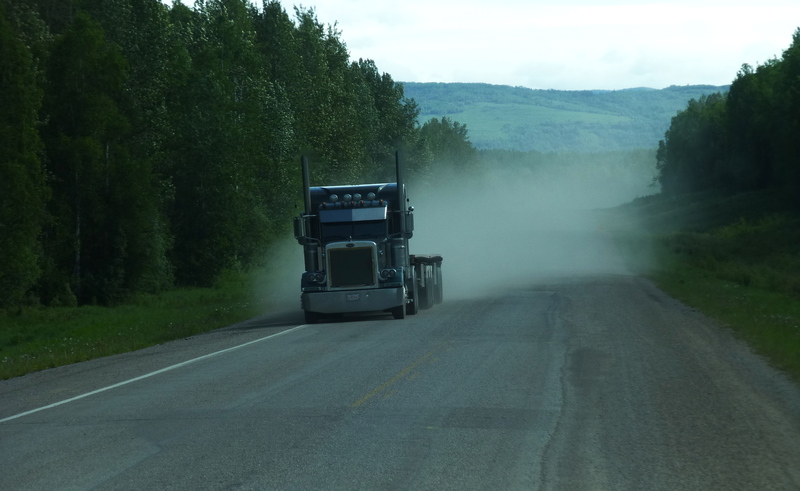 We broke ground early Friday and headed off north to begin driving on the Alaska Highway. 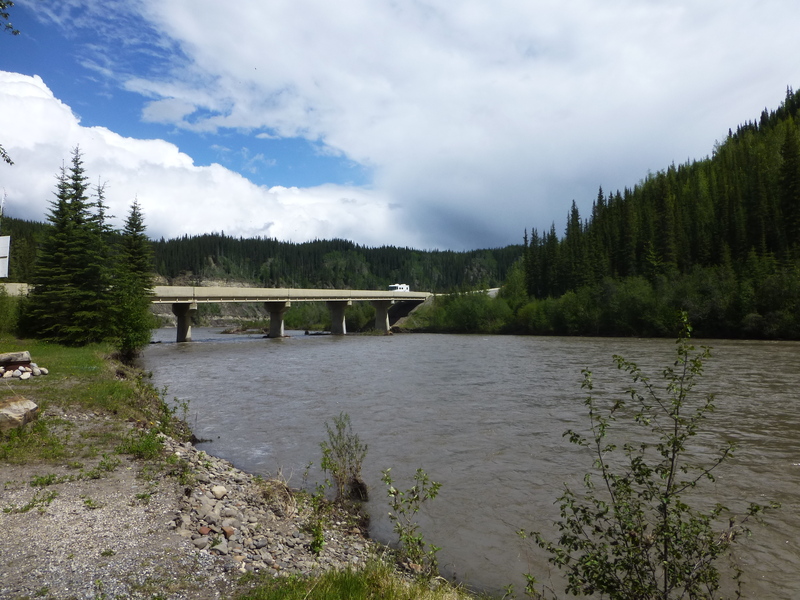 Destination -Mile 162 Sikanni Chief River Bridge. 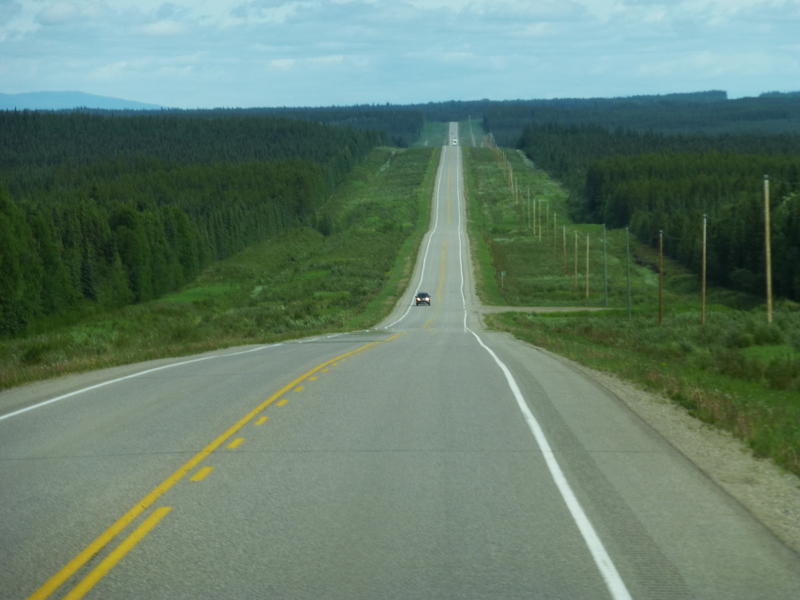 Between now and when we reach the end of the Alaska Highway at Delta Junction in Alaska we will be describing most of the blogs with reference to a historical mile marker. This is because we are traveling through an intriguing history of the highway and mile markers are ingrained in its history. Most importantly, our tool or tour guide in this adventure is the the MilePost. 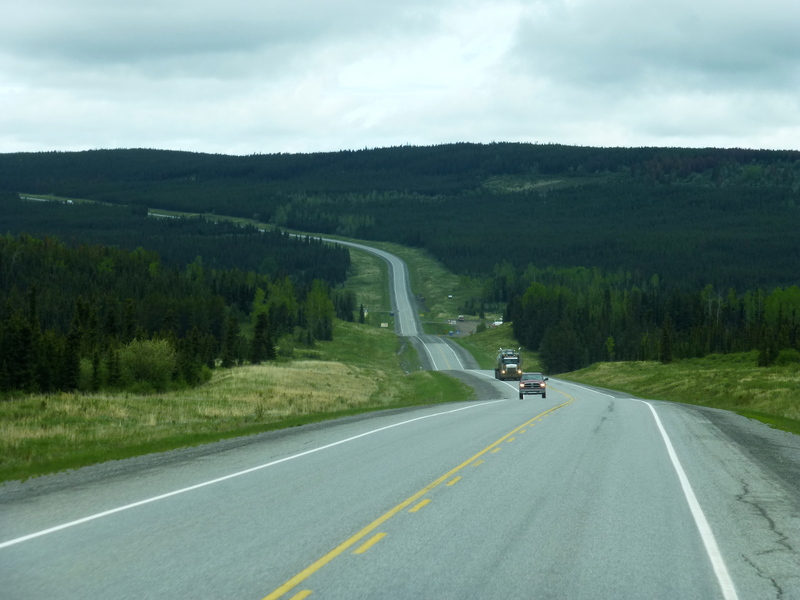 It is a an inch thick book that provides mile-by-mile descriptions of the highways and byways of the north and tells you of campgrounds, food and lodging, gas, turn outs, litter bins and warns you of steep grades, wildlife and more. 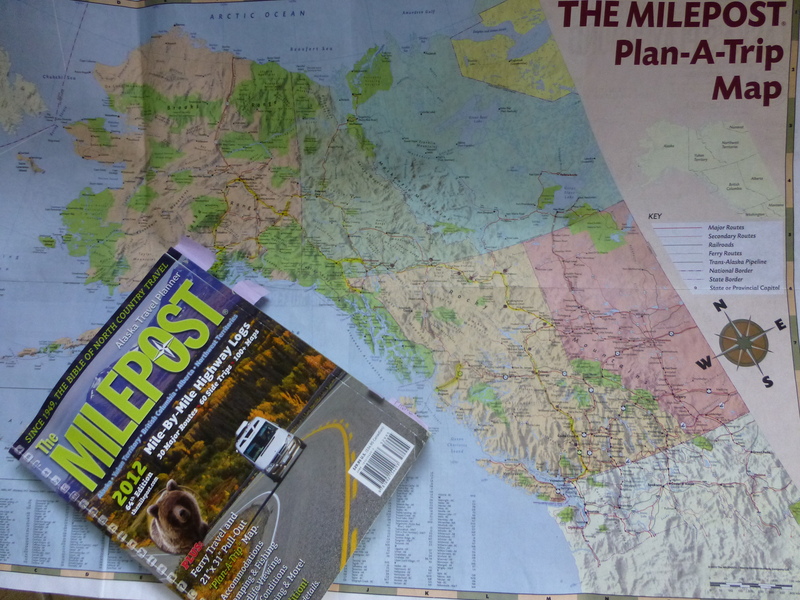 So if you are planning a trip to Alaska and Northern Canada, get yourself an updated Milepost which comes out every March. 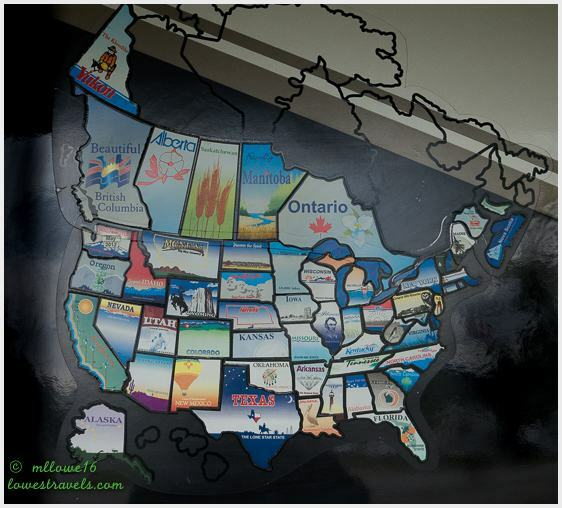 The Milepost and a large planning map, which is included. 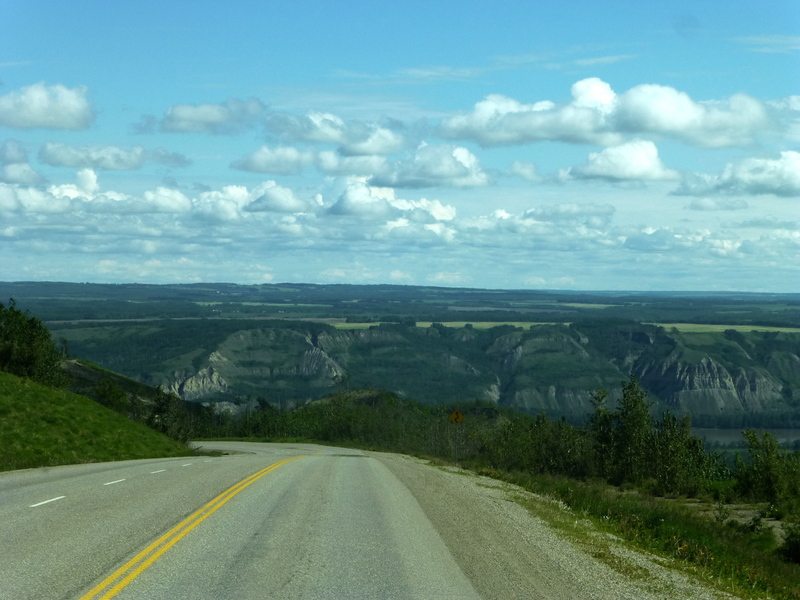 Our drive was again ushered with vista after vista one after another and we are seeing green hills and forests as far as the eyes can see and every turn we made. Simply beautiful ! 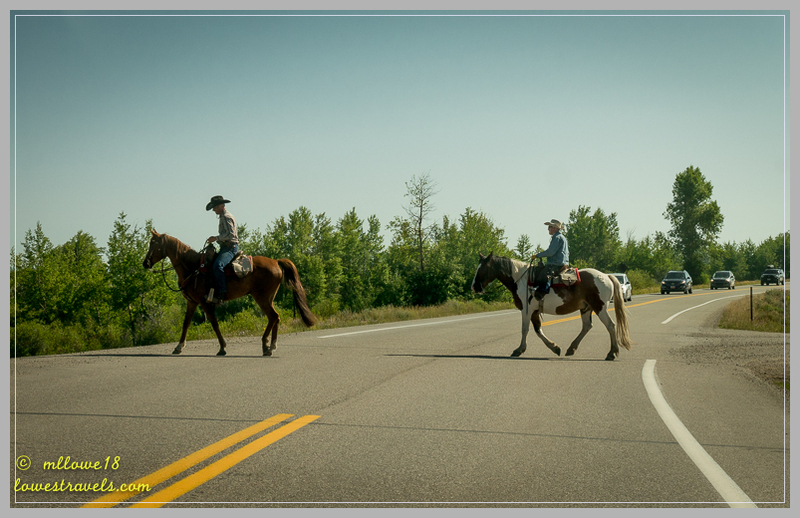 The road was good so far except for the 4 mile stretch with loose gravel starting at mile 227. 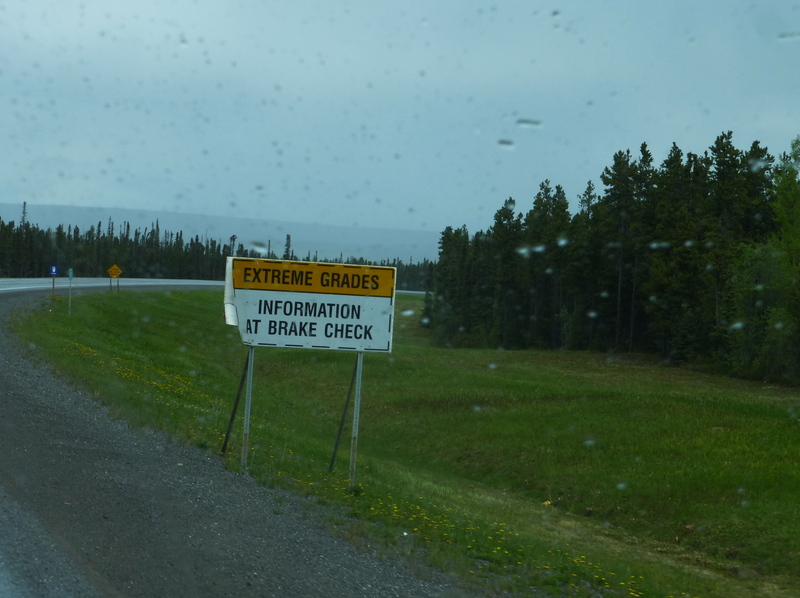 Overall the highway is clearly marked for any hazards on the road and or any constructions going on. We arrived at Mile 162, where we spent the night after three hours of mountain driving. 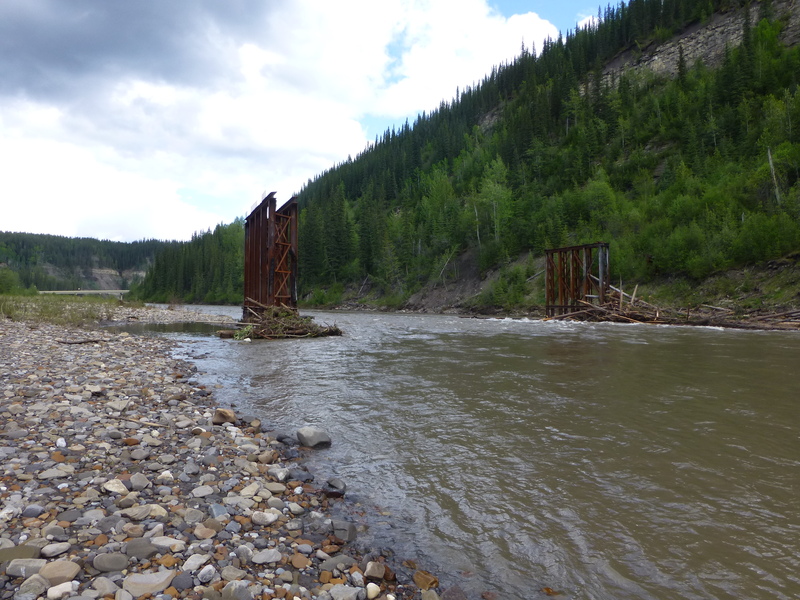 This is also a historical marker as this is where one of the first wooden bridges was completed, the Sikanni Chief River Bridge. It was significant, since the 300 foot wooden bridge was completed in 84 hours. Unfortunately the bridge burnt down in 1992 and has been replaced. 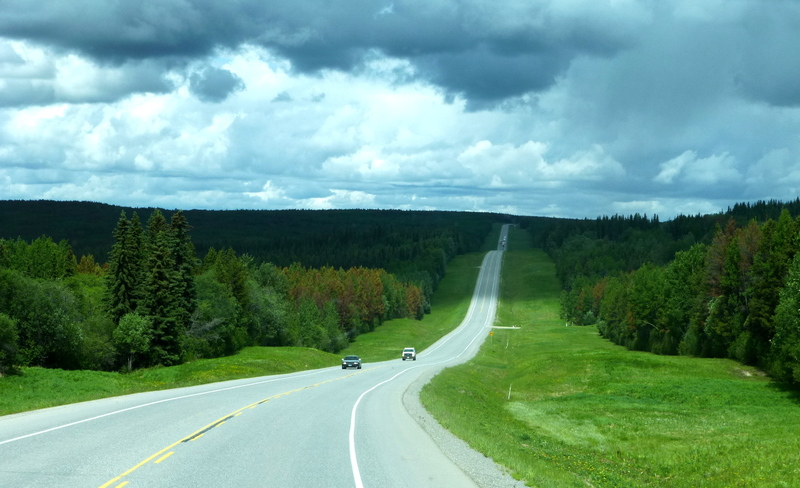 The following day we left for Fort Nelson which is located at historical mile 300 and spent the night there. 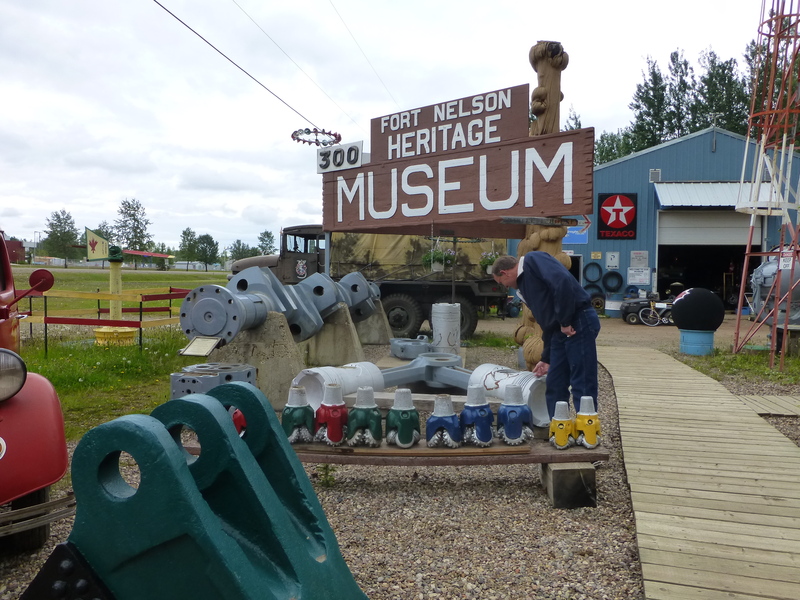 We explored the Ft Nelson Heritage Museum, a must if you are in the area. 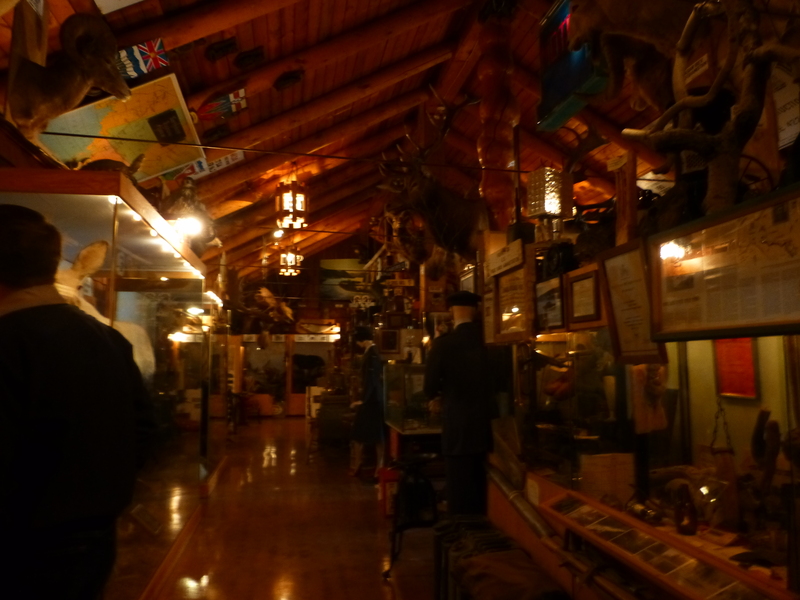 The museum was started by Marl Brown in 1957 and now has grown big with impressive collections of pioneer artifacts, highway construction displays, vintage autos and much more. 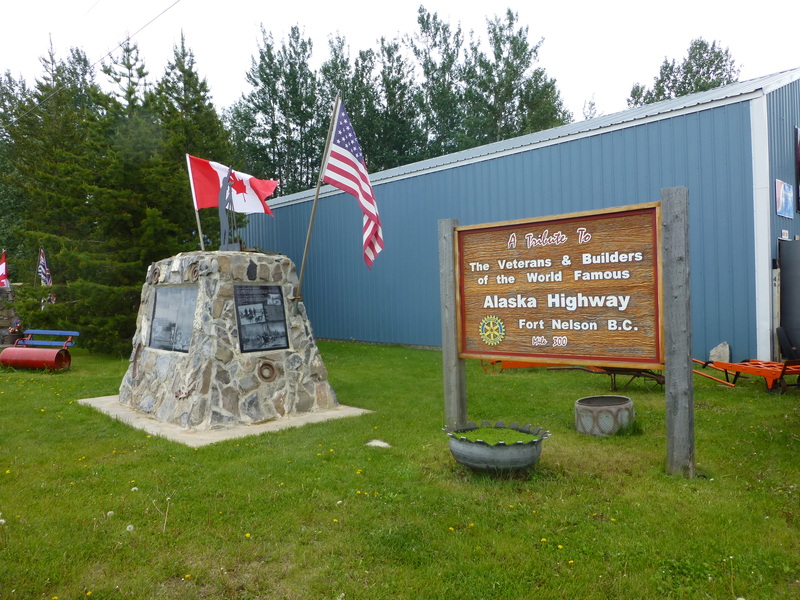 This is also the location of the Alaska Highway Veterans and Builders monument, a commemoration of the workers who helped build the Alaska Highway. 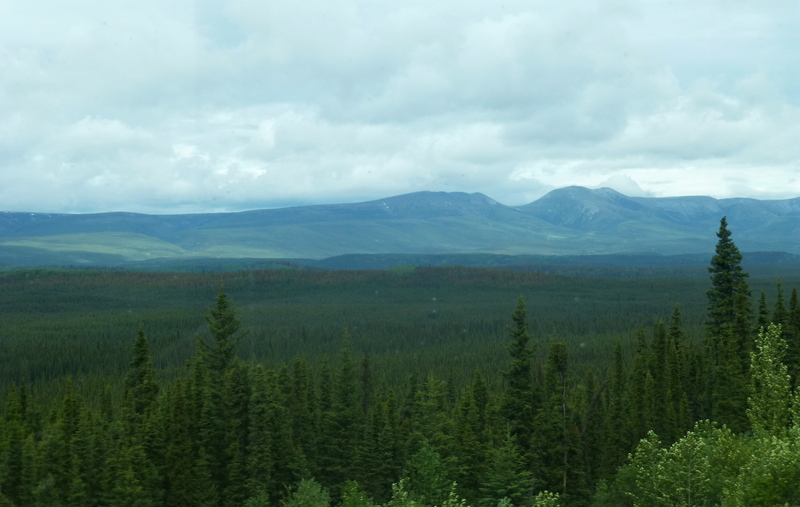 Now we are leaving for Muncho Lake and the next blog will be dependent on internet access. So far we had been lucky with good wifi connection. Have a great Sunday. 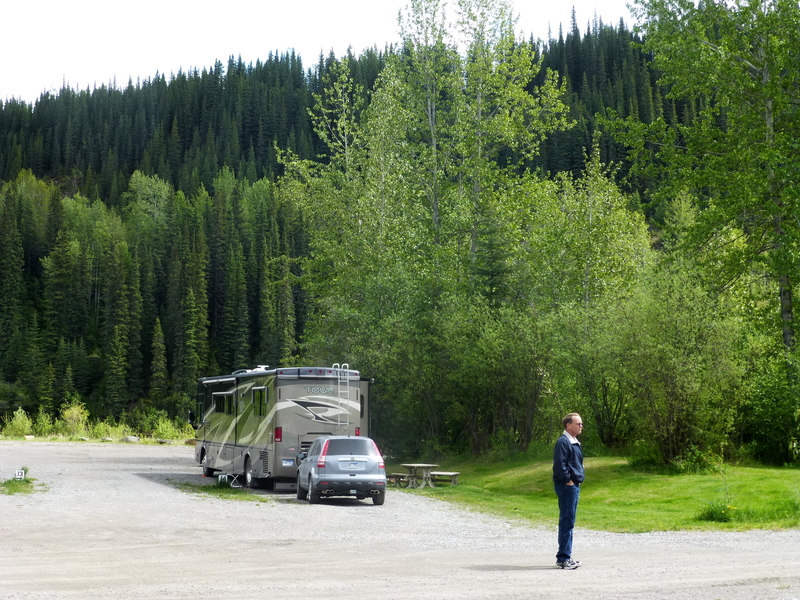 Mile 300- Triple G Hideaway RV Park; along the road very noisy with singing tent campers next door. Four miles of loose gravel. These guys will not slow down for anyone so watch out.